Used with permission of Gail Bartlett. For better viewing, maximize size of screen. 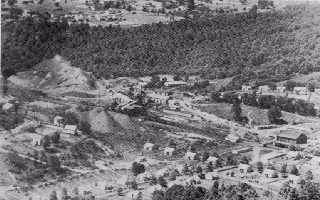 The community of Cranberry as it looked in the 1920's. 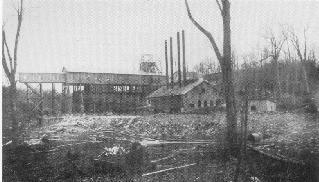 The wooden tipple, shaft, and power house of the Prosperity tipple as shown in a 1906 picture. An aerial view of Cranberry showing changes in the company and community over the years. A part of the Prosperity community can be seen in the background of this 1957 picture. burned in late 1927. The Cranberry post office was located inside the store, at the back. 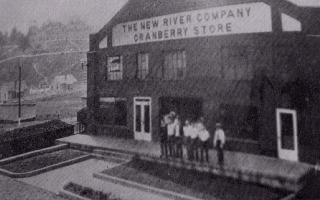 The Cranberry store was closed on 1 September 1958. 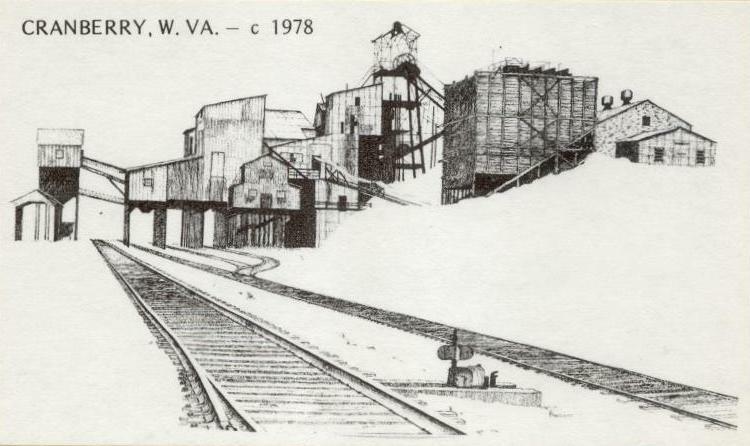 The above pictures are from "The New River Company," a history of the development of The New River Company from 1906 to 1976. When I tell people I grew up in Southern West Virginia, at Prosperity, they often ask me where is Prosperity. I tell them that it is near Beckley. I am never surprised to hear, “Oh, I've been to Berkeley Springs.” Then I explain that Beckley is in Southern West Virginia. When I was growing up, it was considered coal country. It was not unusual to have some one tease me that I must have been a coal miner’s daughter. Of course, I was. Both my dad's and mom's family were coal miners. 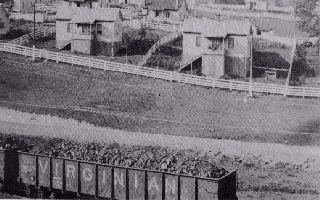 Both families lived at Cranberry, a coal mining community near where I was born. I never lived in a coal mining community since my parents moved to Prosperity shortly after my brother was born. 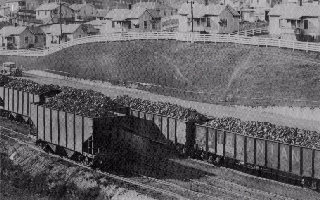 Yet coal certainly played a role in my life and many of the other families in my little community. I knew what my dad would look like when he came home from working all day at the Cranberry mines. He was covered from head to foot with coal dust. I knew he would be so tired that he would need to rest after dinner. In the summer time, he would recline on an old glider we had on our front porch. When it was too cold to be outside, he’d rest on the sofa. My uncles were coal miners, too. Both of my grandfathers were coal miners. Mom’s dad was killed in a mine-related accident when mom was eight years old. My grandfather was not even 36 years old when he was killed. My grandmother was 8 months’ pregnant when my grandfather died. The oldest child, a daughter, was 15, when her father died. I know life was not easy for my grandmother nor the children. To my grandmother’s credit, all the children grew up to be responsible God-loving citizens. In addition to my grandmother raising her own six children, she played a major role in raising two of her grandchildren. In 1928, the husband of my grandmother’s oldest daughter was killed in a mine-related accident. My aunt was 24 at the time with two small children of her own. So, I learned at an early age, that a coal miner had a dangerous job. Early death, bad health, and serious injury were real concerns. I had two uncles die with cancer of the lungs. All my relatives who were miners had black lung. I spoke just this week to a cousin of my dad’s who now lives in Ohio. He mentioned that he had worked in the mines for 16 months when he was a young man. He told me that his brother "got messed up in the mines." They were working together at the time. The cousin left the coal mines of Virginia and went to Ohio to find work outside the mines. Two uncles left the coal mine of Raleigh County to find work in Maryland. Two uncles left Raleigh Countyto find work in Michigan. A friend of mine once told me that all the smart ones left as soon as they could. He was speaking specifically of our generation. And, I think many of those who left had seen so much suffering by their grandfathers, fathers, uncles, and neighbors as a result of working in the coal mines. We knew there had to be something better, safer, and more rewarding than spending hours crawling on your knees or laying on your back digging coal. Dan and Ellen Smith, owners of The New River Company Store Antiques at Cranberry, have many mining artifacts, such as timebooks listing the miners who worked at the Cranberry mine. I was able to locate the timebook for my father for the week that I was born.